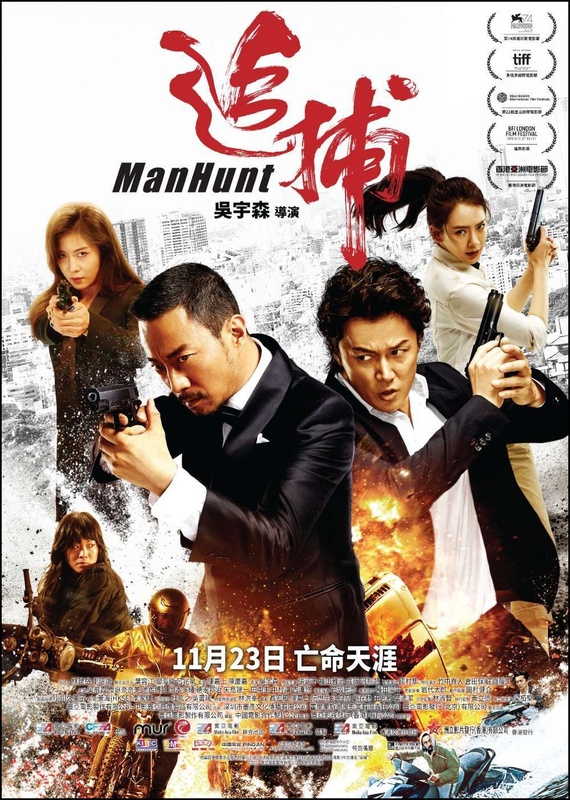 Chrichton's World: Review Manhunt (2017): Old school John Woo? Not quite! But enough for me to have enjoyed it fully! Review Manhunt (2017): Old school John Woo? Not quite! But enough for me to have enjoyed it fully! When I received the news that John Woo was going to direct a modern action thriller I must admit I did get excited a little. But I composed myself since it's been a while and there was a slight possibility he has outgrown the genre. However after just having watched Manhunt I can safely say that John Woo still hasn't lost his touch. But before you jump with joy Manhunt is nowhere near any of his older titles. Perhaps on par with his American ones although one could argue that it's slightly better than those since for one thing it doesn't take itself too seriously. In fact it almost seems like John Woo is mocking or parodying himself. For almost an hour Manhunt plays out like a comedy. Zhang Hanyu as Du Qiu and Masaharu Fukuyama as Yamura play each other's adversaries who become friends. Their interactions are downright hilarious since none of these characters behave like they normally do in action thrillers not even in John Woo's own films. Manhunt also presents us with a mystery that barely is one and certainly lacks the gravity you would expect in a serious film. Woo skips very crucial scenes leading to the actual manhunt which made the film seem amateurish and clumsy. Then I realized that he did it on purpose. And I must admit that definitely was an element that made Manhunt a lot of fun. I mean the story itself was hardly compelling or surprising. In the second hour though things get a little more serious and you get served some real good action in two big action sequences. For the first time ever in a John Woo film two female assassins are featured who play an important role in these action sequences. One of these assassins is named Dawn who is played by Angeles Woo, yes, the daughter of John Woo. I have never seen her before but she clearly was having fun and Woo has made sure she shines. In the final part though things do tend to go completely over the top. Up until this moment the film had been fairly realistic and plausible. Then a science fiction element slips in and things get too crazy for words. In a fun and exciting way. But still I can imagine that especially the people hoping to see a serious action thriller might feel duped. I was bracing myself for the worst but overall I can't complain. Even when John Woo probably was mocking himself he has shown he can make good action films. Question is does he still have the desire to make them? For my sake I really hope so. He should make at least one more with Chow Yun-Fat. In any case I fully enjoyed this one and I can recommend it if you are a John Woo fan.